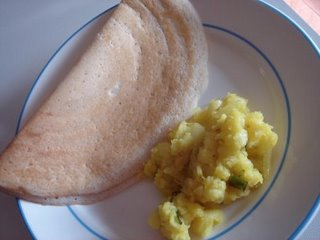 Many pplz make dosa but try this one u will love it. Soak white lentil and rice in water for the whole night. Grind it so that it become a thick paste and add salt in it. Add 4 to 5 tbsp oil in a pan, add mustard seeds and curry leavesin it.Put chicken in pan and cook well. Now add potatoes, crushed cumin,turmeric,garlic paste,salt and crushed red chilli into the pan and cook it.Take out in a dish. Put some oil into the pan and pour the paste of dosa on the pan and spread it in a circle. When it starts to get brown, add the mixture of chicken in the centre of the dosa and fold it from both sides. Cook on both sides and serve. For seasame seed chatni, put roasted sesame seeds, roasted garlic,roasted whole red chillies,roasted cumin seeds & tamarind paste into the blender. Add some water into it and blend. Now take out in a bowl and serve with masala dosa.